Rise and shine, autumn aficionados! We're looking at another applicious treat this fine morning—another mashup of two great foods. Every one of our last five posts or so have been mind-blowing mergers of two or more fascinating foods and/or beverages. 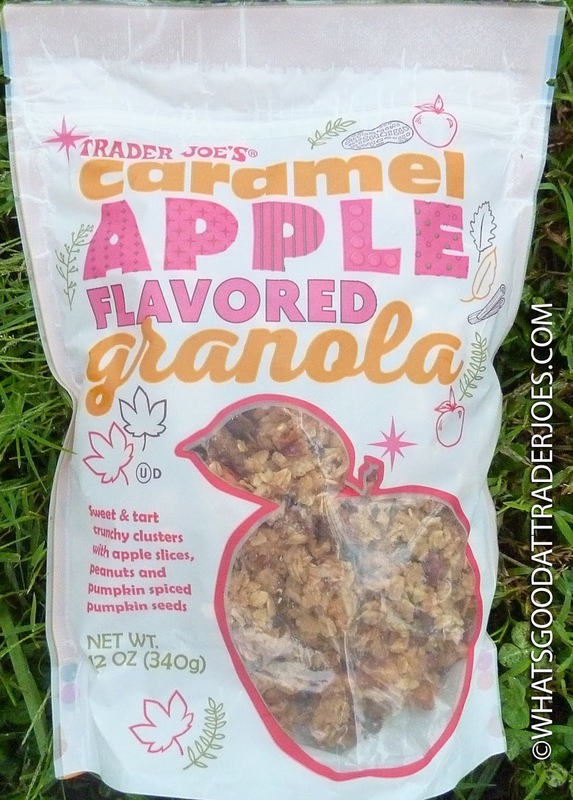 Today: what happens when a caramel apple explodes into a bag of ordinary granola? Not that I have a problem with plain old granola. It's a classic. Always will be. But if you're looking for something with a little more flavor and excitement, look no further. 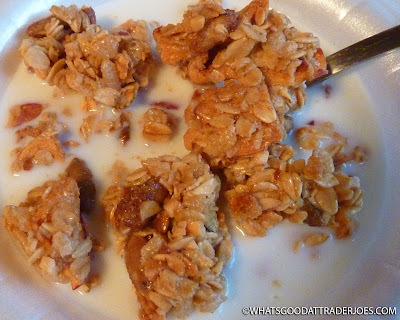 Large slices of dried apple grace the sides of the massive hunks of granola here. Those big "rocks" of cereal do break apart fairly easily with a spoon, particularly after soaking in milk for a minute or two. Some of the heftier chunks are way too sizable for being shoveled directly into the mouth—even if you have a particularly big mouth like me. There's an immediately detectable apple presence in most bites. 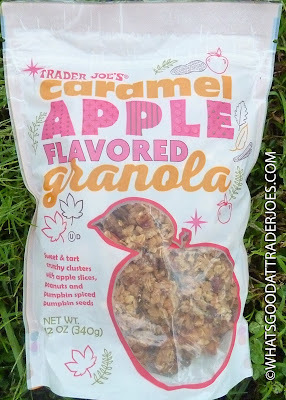 It's sweet and tart, but it tastes much more like dried apple than an actual caramel apple. No biggie. There's still a caramel-esque sweetness, though, too, even in bites with little or no apple. 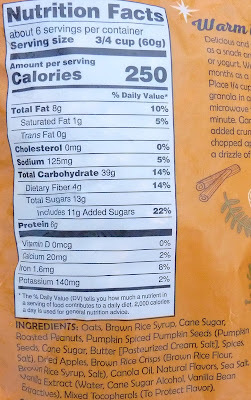 They must have used caramel to fuse all the granola bits together. Actually, now that I've checked, I don't really see "caramel" on the ingredients list, but maybe it's, like, the combo of brown rice syrup, cane sugar, and vanilla extract...? Guess what else I see in those ingredients? "Pumpkin spiced pumpkin seeds!" I guess Russ is right. I just can't escape being a basic white boy...even when I'm trying to strategically balance pumpkin spice with the other flavors of fall. Oh well. You can't really taste it here. At least I can't. Also, both Sonia and I were surprised to see "peanuts" in the ingredients. We didn't taste them or see them much at all. I mean, it's quite possible that they've fallen to the bottom of the bag. We haven't finished the whole thing yet. As a side note, our resealable bag wasn't resealable. It had those two ziplock-like tracks, but when pinched together, they failed to mate like they're supposed to. Again, no biggie. We just used a chip clip dealie. Problem solved. Don't think the bag will be around long enough to get super stale anyway. I love that it has peanuts! It's amazing how many US granolas don't contain peanuts, but that is common in other places. I have traveled in Central America. 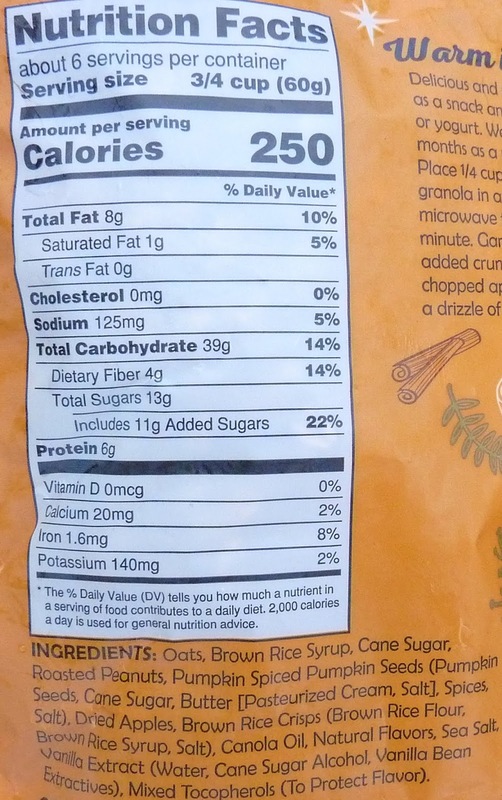 In most grocery stores in Nicaragua, the granola contains peanuts. I really enjoy the flavor in granola. It doesn’t taste caramely to me—it tastes more like peanut butter. I hadn’t looked at the ingredients, but I figured peanuts must be in there. And I had the same problem with the bag not closing. You can make caramel from just sugar. The brown rice syrup is what gets those good clumps- it’s really sticky and sweet, makes a good vegan replacement for sweetened condensed milk but not quite that sweet. I was surprised how much i liked this! My bag is also light on the peanuts, or maybe they’re at the bottom- and the zip top is totally dysfunctional.